My Appalachian Trail thru-hike was an awesome experience! I saw wild ponies, made awesome friends, climbed mountains, ate copious amounts of food, and the list goes on. If you’re curious what went into my hike, you’re in the right place. Although I consider myself an avid outdoor enthusiast, I also have a brain for numbers. So logically I wanted to look into the miles I walked and money I spent. Disclaimer: My husband and I both hiked, so the money we spent corresponds to two people hiking, not just one. If you’re curious about who we are, we’re your average, twentysomething young married college sweethearts. We work for corporate America because it allows us to fund our adventures and use our brains in the way we want. Technically that’s true, but when you bump it up to 2,190.0 miles it gets a little more complicated. It took some serious planning and budgeting to be able to take six months off work, pay the bills we have (cell phone, insurance, etc. ), and still have money left over to play with. We’re lucky in the sense that we’re both semi-frugal people who like to save money. Further than luck, we’re also realistic. We were reading on the internet way before we were hiking about how much money it takes to hike the AT and most people cited $5,000 to $7,000 per person. Upon graduating college in 2016 we both started saving. We got married a year later and we were still saving. We had always had loose plans of hiking in 2018, but as it approached we realized it could be the reality. In case anyone is curious how we got to these numbers, we carried one debit card and one credit card on our trek, and after we were done we pulled our spending from those. 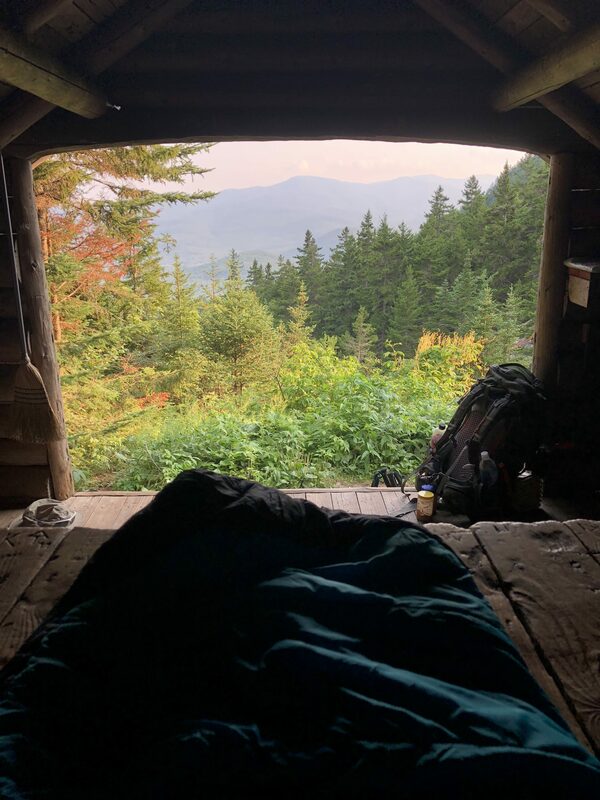 I kept track of mileage in my daily recaps, where I wrote how many miles we walked (including those not on the AT), and what AT mile marker we ended at for the day. It was easy to remember where we had stayed by looking at the mileage we ended at and where that corresponded in Guthook. 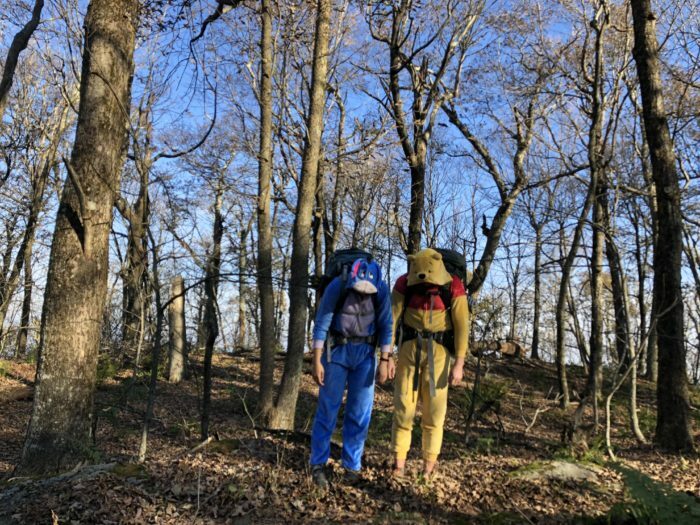 Over the course of 154 days (five months) we completed our thru-hike. According to my Fitbit Alta HR, I took 5,607,220 steps.That averages out to 36,410 steps a day. In terms of mileage, *surprise* we walked 2, 190.9 miles along the AT. My Fitbit chalked it up to just shy of 2,400 miles. That seems realistic considering we didn’t only walk straight along the AT. There were days we took .5 miles side trips to viewpoints, or to get a cold Coke. It also counted when we had arrived at our final destination and were walking around camp, or wandering around town on a zero day. How’d We Walk All Those Miles? 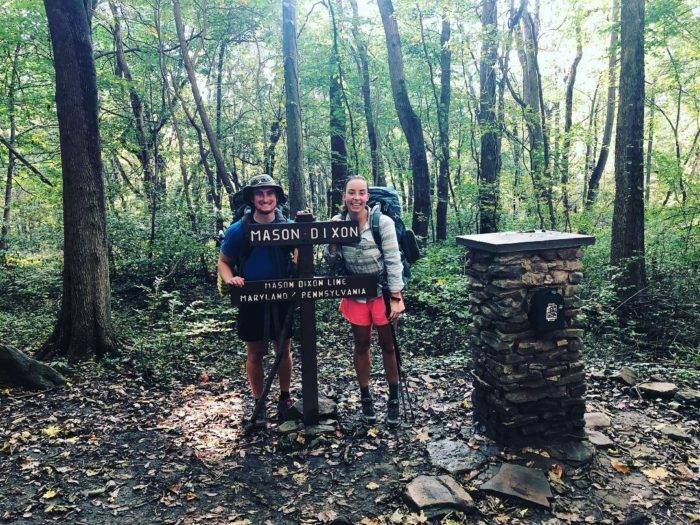 Since it took us 154 days to hike the AT, that boils down to 14.2 AT miles a day. 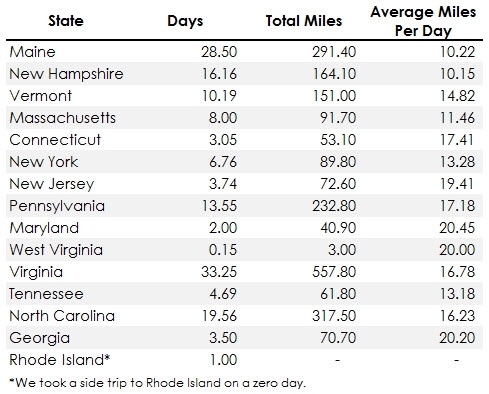 See the chart below for very specific amounts of time we spent in each state. Days were considered based on how many miles we walked that day, versus what mile that day we walked into the state. For example, if we walked 20 miles a day, and the state was at five miles into the day, then we spent 1/4 of the day in the first state, and 3/4 of the day in the newly entered state. 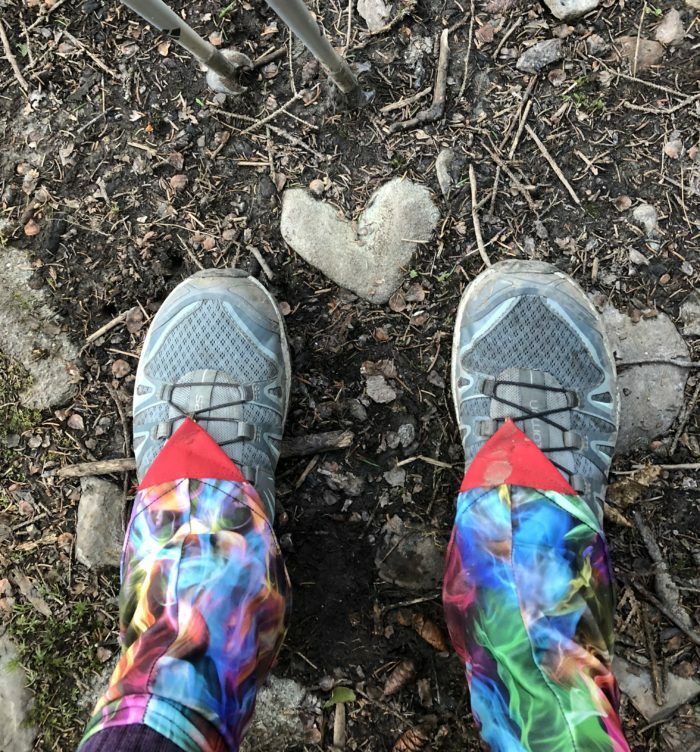 The numbers are a little skewed for days in state, based on when we took our zeros, but in general we did hike fewer miles a day in the beginning and more miles a day at the end. 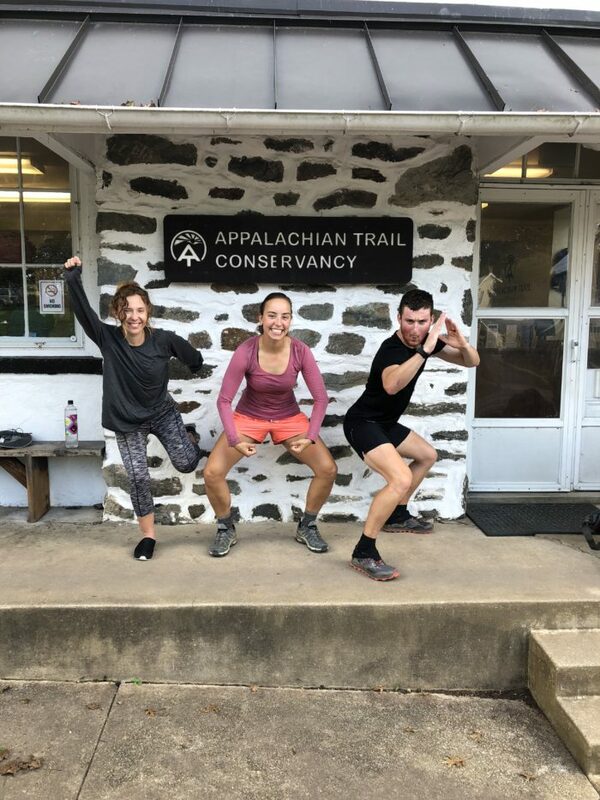 It helped us get our bodies in shape so we could walk all the way to Georgia. 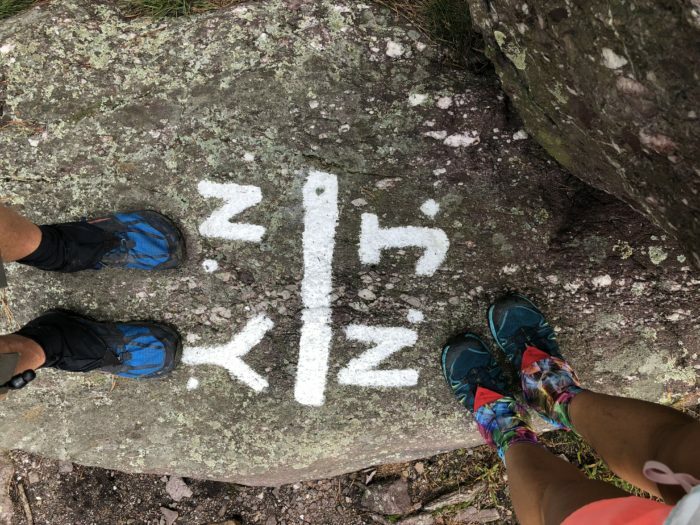 We were able to walk the most miles per day in New Jersey, Maryland, and Georgia. The first two because they were relatively flat, and the last because we were excited and trying to outrun Winter Storm Diego. Where’d We Sleep at Night? We spent 64 nights in our tent, 49 sleeping in AT shelters, 27 in hostels, 12 in motels, and one night of work-for-stay in an AMC hut. Overall, we took 14 zeros, which turns into a true zero every 11 days. Additionally, we took five neros (days with near zero mileage), and completed nine heroes (Days when you successfully avoid the town vortex and instead head in and out in the same day). So We Saved All This Money… What’d We Spend It On? 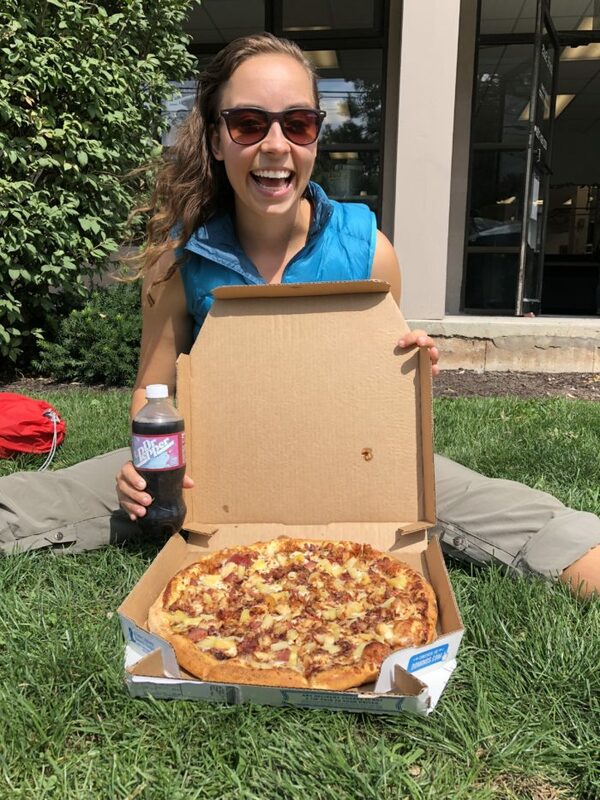 Short answer: pizza and having fun! We spent all the money on having our great experience. Long answer: There are a lot of different ways to hike the AT. Some people prefer to do work for stays, not eat in town, etc. We did not take this approach and rather treated it like a vacation with limitations. If we were in town and wanted to eat food, then we did. In the beginning we only stayed indoors on average once a week (two nights sandwiching a zero day) and otherwise stayed out in the woods. That was a great approach for us, because when it started getting colder we still had the money to spend to stay indoors more frequently. Equipment is referring to anything we bought on trail for gear replacement (shoes, socks, Eeyore onesie, etc.). Everything else is pretty self explanatory. Reminder: this is for two people. In terms of resupply options, Walmart actually ended up being the most expensive resupplies we got. What Do You Mean You Spent the Most Money at Walmart? Well folks, turns out Walmart has everything you could ever need. Including those things that you don’t really need. 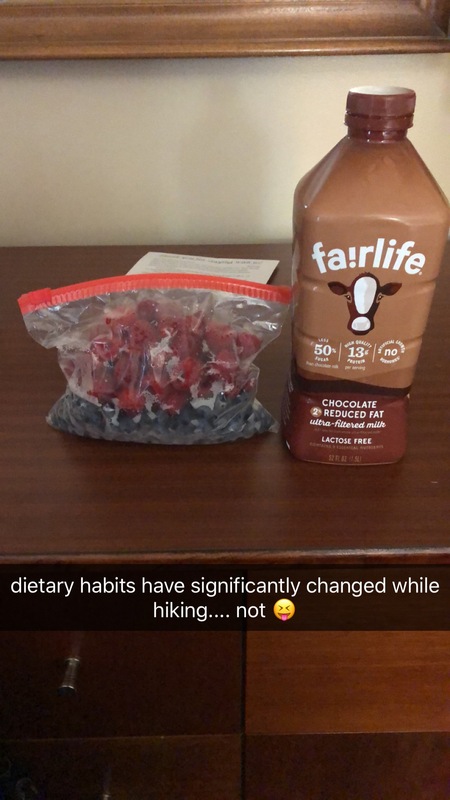 It took me a really long time to not be packing out extra soda, berries, and other things I was supposed to eat in town but didn’t fit in my stomach. With the variety also comes the bills. 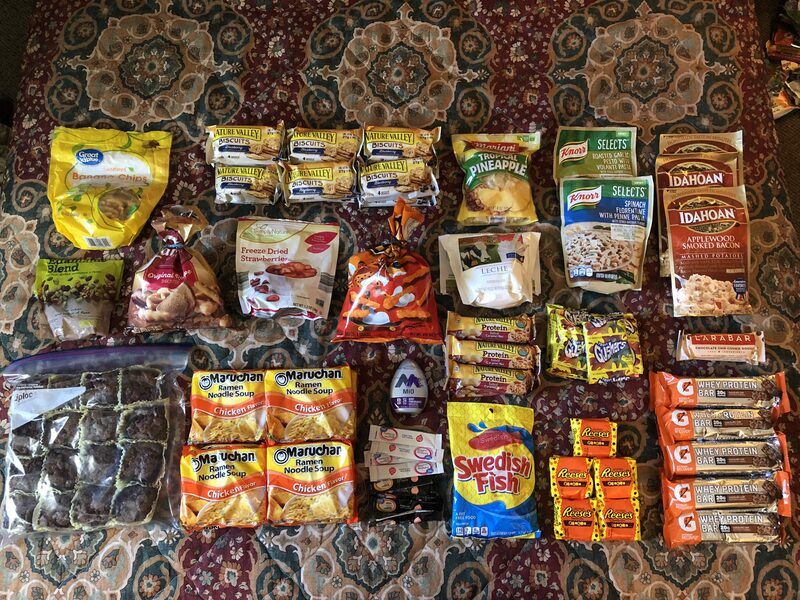 You can buy real protein bars, all the fun snacks you want there, but they’re generally more expensive than generic snacks of dollar store products. Do I regret buying gushers, an Eeyore onesie, and countless 52 ounce jugs of FairLife chocolate milk? Absolutely not. Fun fact: FairLife chocolate milk generally costs $3.29 at Walmart, contains 92 grams of protein, and just under 1,100 calories. It’s heavy at 52 ounces, but if you’re just getting it for a town day or even for a hero to drink at the laundromat, it’s super cost effective. Plus minimal lactose = my body feels better. 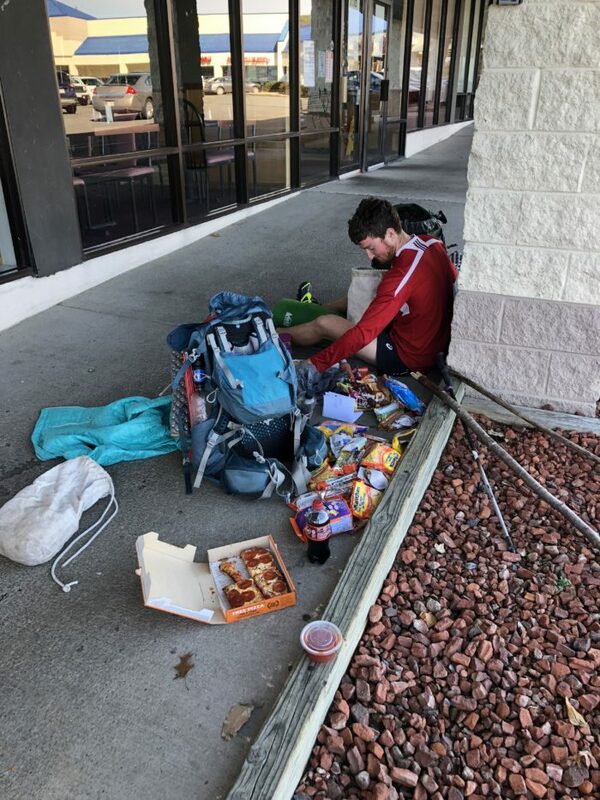 Yes, hiking the AT was expensive. Would I do it again? Of course! I think it was money well spent and it turned into an experience that we’ll remember for a lifetime. 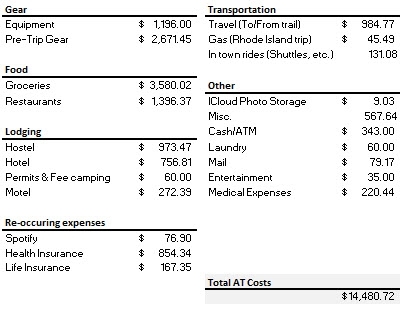 For the two of us to go hiking for five months it cost $94.03 a day, including all the gear we had to buy before hand. I struggle to think of an adventure we could go on that was that much fun and cost less than $100 a day.